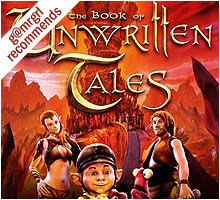 summary: It took a while to be told, but The Book of Unwritten Tales holds an epic adventure between its pages, bringing to life a gorgeous, multi-dimensional, quest-laden world of glittering seas and fiery mountains, and filling it with some of the most endearing game characters of all time. 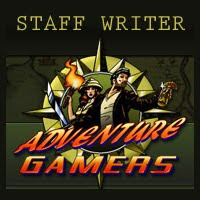 review: Read my review @ Adventure Gamers®. 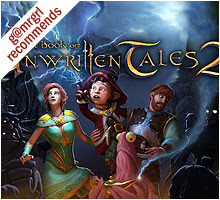 This review is a part of the 'Casual Collection: September 2011 New Releases' article. In 1880, an expedition funded by an industrialist aptly named Coins plundered a tribal island while seeking an artifact that gives its possessors all they desire. In retaliation, a shaman cursed them, eradicating all but Coins and two henchmen, who escaped with the artifact and for the next twenty years reaped its benefits to their hearts' content. But the curse, undeterred by time and space, has finally caught up with Coins, and you, playing as private eye James Voodoo, are summoned to help solve his murder. 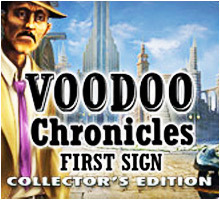 This premise promises a gripping casual adventure, but Space Monkey's Voodoo Chronicles: The First Sign can't decide whether it wants to be a noir whodunit, a supernatural caper, a mythological mystery, or all of the above, and its story rapidly degenerates from a crime procedural into disjointed scenarios involving a weird cat, a wisecracking skull, a kraken and Norse gods, making you wonder by the end if you're still playing the same game you started. And despite the attractive art and lengthy five hour play time on hard mode, its puzzles are too easy and hidden object searches too tiresome at times. The investigation is based in and around Voodoo's messy office, but he also travels on an Orient Express-like deluxe locomotive to Coins's metropolis Richtown, races through a forest in a horse-drawn wagon with feral wolves in pursuit, sails on a storm-battered ship, and crash lands a blimp on the tribal island. Each location is a self-contained chapter of a few screens, which limits both the playing area and complexity since neither quests nor objects are transferred between chapters. Instead, every scene needs to be frequently revisited to find relevant hotspots activated since the last time you were there. The main challenge comes from the 18 hidden object screens, repeated once each. Chock-a-block with random junk, these yield one usable object per turn. The clutter isn't a hindrance, but the screens are dark enough in large patches to warrant raising the monitor's brightness, and many items are made difficult to find by obscuring them under the interface elements or behind other objects till only barely-discernible portions are visible. 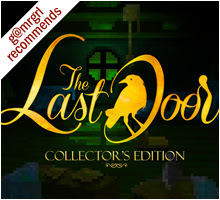 The dozen standalone puzzles run the usual gamut of pipes, gears, switches, pattern matches and object assemblies, and while they are well-illustrated and relevant to their situations, they rarely hold you back longer than a minute or two. On the bright side, they reward you with two hints per completion to supplement the single (very) slowly recharging hint at your disposal during hidden object searches. Hints can also be collected by locating tiny skulls lurking on occasional screens. Surprisingly, you can't access any of these hints while you explore, though given the confined areas that really shouldn't be a problem. Progress is linear, but proceedings are confounding nevertheless as the story skips forth in fits and starts, launching arcs and characters which bear little or no relation to each other: the natives are trying to derail the investigation; a mysterious girl needs constant saving from strange situations; a missing gangster is replaced by a voodoo doll; a detective driven insane by the curse (or the case, it's unclear) is levitating in an asylum; storms and sea monsters are destroying ports and cantonments; a snarky disembodied skull like Monkey Island's Murray appears from nowhere; a cranky cat isn't what it seems to be, nor is the island when it's finally located. The ambition in attempting to string together such diverse topics and locations to create a complex stage for the adventure is evident, but little is explored in depth or explained clearly enough, relegating the game to a progression of dioramas. Voodoo himself is a crusty, scientifically-inclined gumshoe who starts strong, but even he can do little but gape at the increasing peculiarities as time goes on. The big plus of The First Sign is the charming art, which alternately seeps decadence and reeks of grime. Scenes like the gas-lit city centre, the port at dusk, and swanky Richtown with its skyscrapers and hovering blimps, are eye-catching and detailed with fine animation like sweeping clouds, wavering shadows and steaming valves. Cutscenes are quite fascinating, particularly the Coins Express rolling into a station billowing plumes of white smoke, an orchestral recital by toy monkeys, and a burning zeppelin crashing into the island. Meanwhile, wandering aboard the lurching train, especially the brief ride atop it, is as close to reality as such animation can get. The background score varies from jazz-infused tracks in town to Oriental fusion on the island, but the audio winner is the multi-layered ambient effects that effectively recreate each milieu, be it a bustling city or a burning train. There is substantial dialogue, and the full game is voiced, even the briefest cameos. Voodoo's gravelly voice, the skull's cackle and the mobsters' over-the-top Italian drawls are in sync with the drama, but other characters run amok with accents and create noticeable dissonance. English translation of onscreen text is erratic and mistakes riddle newspaper headlines, but they still recount Coins's history efficiently. The baffling conclusion of the main game may have you scrambling for the Collector's Edition bonus chapter for an explanation, but there's none coming. Instead, it's a prequel that has neither story nor substance, nor any useful impact on the main plot. Here you play as the mystery girl who has to save native children trapped by Coins before the he activates the artifact. Five screens stuffed with typical items are partnered by three equally uninspiring hidden object dumps that follow no rules of era or location. There are no solitary puzzles, and set by default at 'easy', the chapter spews step-by-step directions to solve the juvenile inventory quests while heaping indignities on you, like forcing you to find a rope even as one you have just used (and inexplicably discarded) dangles in your face. This segment is also voiced, but the natives sound suspiciously similar to each other and their British-accented saviour. Luckily (and yet equally inexcusably), the torment lasts only fifteen minutes before the it terminates with the suddenness of a power-cut. Voodoo Chronicles seems intended to be a series about Voodoo's cases, since this edition has no relation to the craft except for some hex bags and a couple of gratuitous references to Haiti. But any crime story, even one with supernatural elements, must have logical clarity that connects the dots with plausibility instead of distracting with mumbo-jumbo. 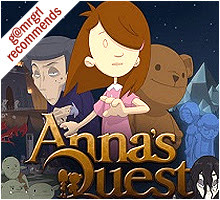 The First Sign has all the elements of a good hidden object adventure: a plot with potential for twists; vibrant art and animation; an engaging lead; some interesting guest stars, and numerous obstacles to overcome across a variety of locations and situations, but it squanders its opportunities with tedious gameplay and incomprehensible storytelling. As a result, the main adventure is ultimately just average and the CE expansion is a joke, though the attempt to step away from the trodden turf makes you hold out hope for Voodoo's future assignments. A sleek cinematic follows a terrified woman as she flees through a storm-swept forest, chased by a faceless malevolent entity till she finally collapses on the outskirts of the titular fictional town in Vermont, USA where Artifex Mundi's Enigmatis: The Ghosts of Maple Creek is set. The game starts as she regains consciousness, but not her memories – she recollects nothing that explains her precarious predicament, or the blood on her hands that isn't her own. The settlement hasn't weathered the storm any better, reduced to a messy heap of shattered housing, fallen trees and short-circuiting electric poles in the aftermath of the tornado. The damage, however, has also shaken loose secrets long buried within walls and under floorboards, and the cluttered wreckage is ideal for some riveting sleuth work, hidden object searches, and puzzle-solving. Some handy clues soon help our amnesiac protagonist discover the basic facts: she's a detective who was investigating the disappearance of a teenager, the latest of several young women gone mysteriously missing from the area over the past eight decades. It's up to you to scout the inexplicably abandoned town and its surroundings, which include a guesthouse, a chapel, some disheveled homesteads, a gas station, the nearby hiking trails and a sinister church. Only by piecing together the scraps of evidence – photos, newspaper articles, reports from past investigations – can you hope to solve the case before the evil consumes its newest victim, and likely you too. But Enigmatis guards its secrets closely and yields no easy answers during its six-odd hours. You're quickly drawn into a flurry of macabre discoveries, and suspicion veers between human cult and criminal adversaries, and supernatural ones like ghosts. Each assumption is backed by plausible evidence, and debunked rationally as more clues are unearthed. 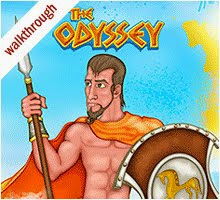 The quest is led systematically by the detective, but you're not relegated to mere mouse-driving: the collaborative gameplay allows you to analyse the leads and work out the correlations between them yourself. The investigation favours inventory-based activities and object hunts over standalone puzzles. Searching the fourteen hidden object screens thrice each is repetitive, but not overly tiresome due to the stylish art. Some lists have an object or two which require minor interactivity to find, and in an annoying oversight, these hotspots remain active even after resolution, continuing to sparkle for your attention even during later revisits. Inventory quests are well-integrated with the plot and yield not only useful tools but clues and pieces of puzzles as well. Rewards are sometimes disproportionate to the effort required, like a convoluted excursion spanning hours to uncover an object of only mechanical value, but such missteps are rare. There are fewer than a dozen logic puzzles, but quality trumps quantity, and each beautifully illustrated challenge, be it a jigsaw or a pattern match or a lock to be picked, is entertaining to solve. In an ongoing drag-and-drop puzzle that lasts throughout the game, you pin evidence items onto a wall and group them to either clarify the dilemmas or create more avenues for investigation. Mistaken links aren't fatal, but deducing correctly on your own provides a genuine sense of accomplishment. Progress is linear, with only a couple of activities to do at a time. Your current objective is listed in a journal, which helpfully documents your observations according to related events and connects each goal to its specific set of clues, eliminating the usual pain of rifling through scores of pages for smidgens of relevant information. A map is drawn out as new areas are revealed, and on the easier of two difficulty settings it marks out locations with pending activities. Exploration can still be irritating, however, due to an unnecessarily complicated town layout (a large portion of which can only be reached by rappelling down from a balcony and crossing many derelict yards), and the order of quests, which force you to make this and other lengthy trips again, and again, and again. Based in the verdant Appalachians, Maple Creek is predictably scenic, and the richly coloured, tastefully drawn screens showcase this appeal, albeit in a dark, gloomy way. Snooping around endangers you to some gasp-worthy moments, and the game consistently sustains a creepy tension. This undercurrent of terror is augmented by the soulful piano-and-cello soundtrack and ambient noises like the creaking of damaged buildings, tolling of church bells and the pounding of the protagonist's heart. Some segments are voiced, like the animated cutscenes and certain conversations, and the performances are competent, barring one character whose weird hamming grates on the nerves. The onscreen text itself is crisp and easily understandable despite a few typos. The main adventure wraps up with a cliffhanger that paves the way for a sequel, while the Collector's Edition bonus play provides a prequel set decades earlier. The hour-long extension traces a past investigation into the case, and ties up some crucial loose ends of the main game even as it tears apart its unpleasant yet somewhat acceptable explanation with a centuries-old secret that ups the ante for the next episode by several notches in one fell swoop. Maple Creek of yore is depicted in hazy, rose-tinted shades, and it's delightful to compare the town then with its current iteration, though it has barely evolved over time. The music is sweeter – soothing almost – but the sense of doom is no less oppressive as you uncover clue after morbid clue. The gripping story bolsters the chapter's easy gameplay, which features an abridged environment, basic inventory quests, five well-designed but simple puzzles, and five hidden object screens again visited twice each. And though you already know the ill-fated conclusion of the case, the finale is nevertheless gut-wrenching to witness. A casual adventure that keeps you guessing till the end is rare; rarer still is a CE expansion that thickens the plot instead of scraping out a few extra minutes of play. 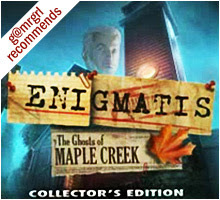 Enigmatis: The Ghosts of Maple Creek is a fabulously extruded mystery, and the bonus chapter is essential if you wish to learn the real secret (and trust me, if you like tense, twisted tales, you will). A few more, and tougher, puzzles would have upped the overall challenge, but the unsettling creepiness of the quaint rural town, the baffling mutterings of the peculiar townsfolk and some genuine frights embellish the intriguing story and smart production enough to create a chilling experience that will definitely haunt you even after the credits roll.